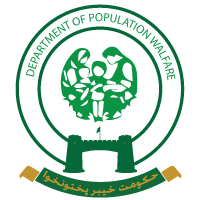 The national population program started in 1965, Passing through changes in its approach and initiatives, In 2002 the program has been decentralized under the administrative control of province. The approved population policy in year 2002 is on ground to reduce the unmet need and enhance accessibility to family planning services. The programme is having three main components i.e. Administrative Organization Component (Provincial set-up. District set-up and Tehsil set-up). Support component (Information Education and Communication, Training, Logistic, Monitoring/Evaluation and Management Information System). The Family Planning /Reproductive Health services are provided by the programme/non-programme service delivery i.e. Family Welfare Centers. Reproductive Health Services Centers/Training centre Mobile Service Units. Male Mobilizers and the non-programme service delivery i.e. Outlets of the Provincial Line Departments. (Health & NGOs), Registered Medical Practitioners, Hakeem and Homeopaths. Keeping in view the demographic indicators of the province, the network of service delivery is being increased with emphasis on underserved rural and periurban areas to meet the challenges of MDGs regarding fertility reduction, Increasing the contraceptive prevalence rate, and reducing, the population growth rate as envisaged in the current plan. To ensure coordination and reviews of the programme. Provincial Technical Coordination Committee headed by Secretary and a District Technical Committee in each district headed by the DCO & Executive District Officer Health are functional and meet periodically to review the performance and take measures for further improvements. The main focus areas are implementation of standard operating procedures (SOPs), focused advocating FP services to gain political and opinion leaders support, Strengthening monitoring/evaluation, Enhancing public private partnership, intersectoral coordination to expand services to meet FP International Conference goal 2020 of universal accessibility to FP services. The strategic plan aims at decreasing TFR, increasing the CPR and supports improvement in existing structure and system being implemented with the outputs i.e. policy planning, administration and management. Monitoring and evaluation system, enhanced technical capacity and addressing socio-cultural issues. To achieve this an implementation plan has been developed. Budget provision proportionally made with maximum share to the service delivery component particularly and management followed by support components as a strategic intervention.